Both Guns Are Out There. Christmas later claimed that he’d heard one of his riffs from these sessions on Black Tie White Noise, but he didn’t specify which track (the consensus is that it was the title track) nor did he claim (as far as I know) that the riff was from “Both Guns Are Out There.” Now Bowie reusing a riff from 1975 on a song cut in 1992 wouldn’t be surprising in the least: Bowie is a legendary musical pack rat, with many of his compositions built out of shards of discarded songs. A few years ago, the above track surfaced, purporting to come from some mid-Nineties Bowie recording session and allegedly titled “Both Guns Are Out There.” I very much doubt this track had anything to do with a song that Bowie and Christmas worked up in 1975. If the track is Bowie, and if its title is legit and not just a bootlegger’s fancy (the latter’s possible—it is the only lyric heard in the track), then I’d say Bowie just used a scrapped title from his files for a completely different work. If this “Guns” is legitimate, it could be Bowie reworking some outtakes from Black Tie White Noise (particularly the trumpet loop, which doesn’t sound like Lester Bowie, however), perhaps for some proposed remix for a BTWN track or as an experimental piece considered for either Buddha of Suburbia or Outside. Or perhaps “Guns” is just a piece of flotsam that someone on the Internet decided to call a lost Bowie track. Recorded ca. 1992? 1994? Who knows? 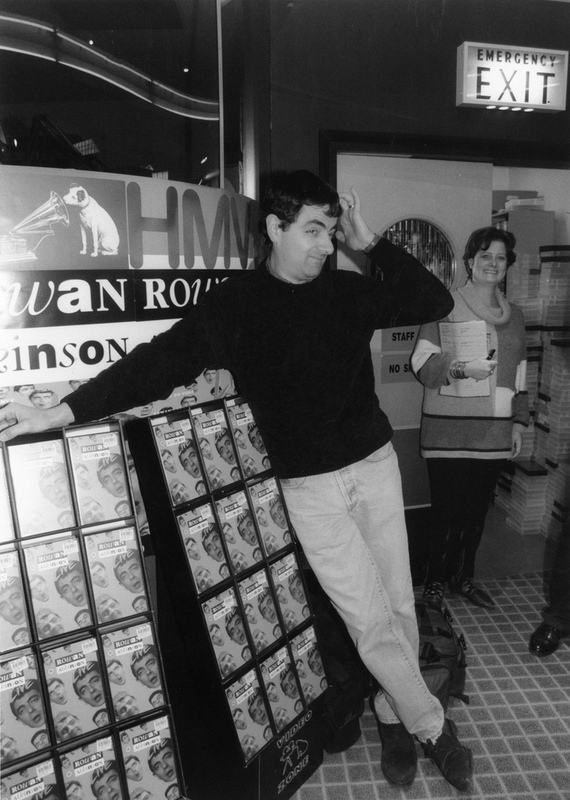 Top: Rowan Atkinson does an in-store promo at HMV, 1992.